4 Bedroom Detached House For Sale in Hitchin for Offers in excess of £800,000. 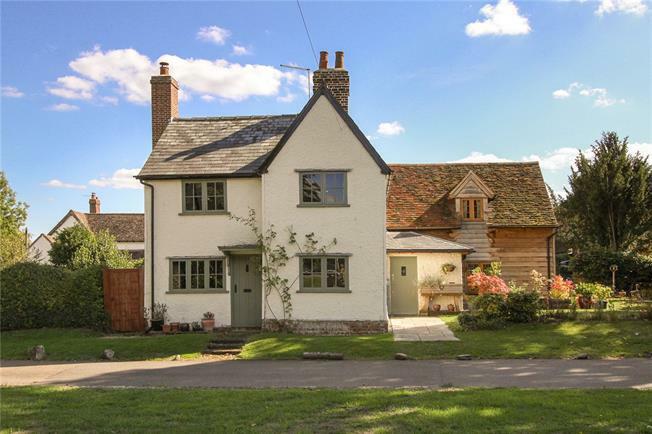 An opportunity to purchase this exceptional and prestigious detached character house with origins dating back to the 15th century, which is said to be the oldest surviving dwelling in Pirton, so understandably, a historically important property such as this has the protection of a grade ll listing. The property stands proudly at the foot of the 'Great Green', being one of the most sought after locations to live in the village. It is graced with many period features, including a wealth of exposed beams, though with the exception of a couple of doorways, the ceilings are unusually quite high, making the house feel light and airy. The property has been refurbished to a very high standard throughout, with much of the ground floor benefitting from under floor heating and provides a thoughtfully arranged accommodation, making this ideal for the young family or just those that are seeking something special in the countryside. The accommodation has a lovely reception hall with a feature brick floor and well fitted cloakroom. The dual aspect living room has a very attractive Inglenook fireplace and the generously proportioned study a fine view over the green. The family room is part of a skillfully executed oak framed extension, pegged together in the traditional way and this also has a log burner. Steps lead up to a splendid hand crafted kitchen/diner, which is fitted with a generous selection of storage units, further enhanced by extensive quartz work surfaces and a curved oak breakfast bar. there is also a deep 'Belfast' sink and the welcome addition of a walk in larder. Approached via the landing, the master bedroom has a superb beam structure and a tastefully fitted en-suite shower room. There are three further comfortably proportioned double bedrooms and they are served by the very attractively fitted family bathroom. The property sits within a generous plot with attractive gardens to all sides and this is laid mainly to lawn and further enhanced with mature shrubs and hedging. Surrounded by glorious Hertfordshire countryside, Pirton is much sought after and benefits from such amentiies as a village store and post office, two pubs and a well regarded primary school. Just a short drive away is the bustling market town of Hitchin which host an excellent selection of shops, restaurants, educational establishments and leisure amenities, together with a fast and frequent rail service to London Kings Cross.